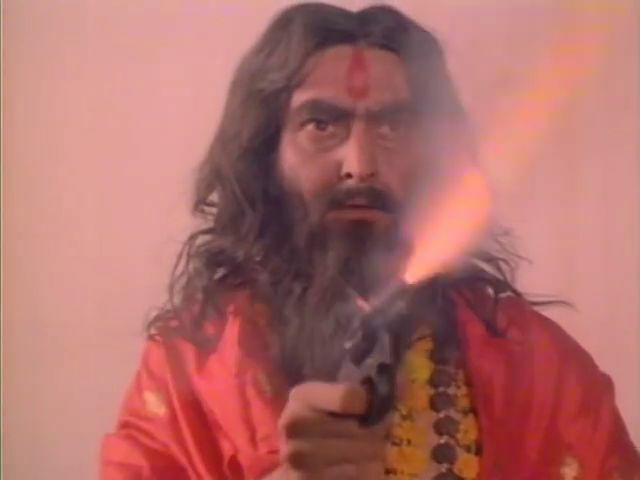 Satyajit Ray’s third and last detective story film was Joi Baba Felunath: The Elephant God (aka Joi Baba Felunath, 1979). Like he did with his earlier detective film The Golden Fortress (Sonar Kella, 1974), the multi-talented Ray based this film on one of his very own detective novels, Joi Baba Felunath (1975), featuring his usual hero, Feluda (Ray wrote 35 novels and stories starring this fictional character ). Topshe is played by Siddartha Chatterjee. The basic tenor of Joi Baba Felunath: The Elephant God is that of a family-oriented adventure/crime melodrama that would appeal to a wide range of ages and tastes. There are moments of curiosity, comedy, and tension that are probably particularly appealing to a youthful audience. In addition, the film’s focus on puja ceremonies in the holy city of Kashi (aka Varanasi or Benares) is a colorful setting that is likely to fascinate many viewers. Ray presents the tale adroitly with his customarily skillful use of atmospheric compositions interspersed with well-edited dramatic closeups. And of course Ray, besides providing the film’s story and screenplay, also composed the musical score for the film. A major theme threaded throughout Joi Baba Felunath is truth-telling. Most of the characters our three protagonists encounter in this story are involved in lying at various points along the way. And that, of course, is what makes detective Feluda’s problem and task a challenge to unravel. 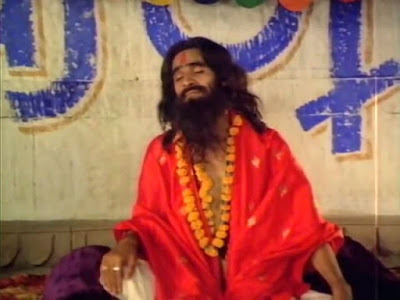 The story of Joi Baba Felunath is told over five phases or acts. 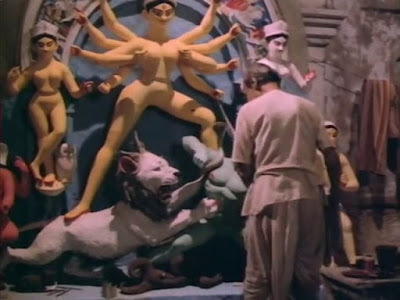 In the opening sequence, whose significance as a clue to the viewer will only be made clear much later in the film, a young boy, Ruku, watches and listens to the idol-maker Sashi Babu tell him details about Hindu deities Durga and Ganesha, who are subjects of his work. 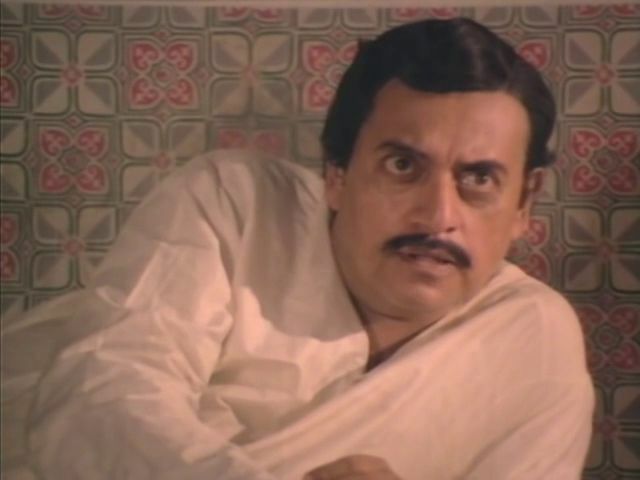 Ruku lives in a wealthy estate which is then visited by an abrupt and presumptuous businessman Maganlal Meghraj (played by Utpal Dutt). Meghraj makes an offer to buy from Ruku’s father, Umanath Ghosal (Haradhan Bandopadhyay), a small (about three inches in length) gold and diamond-studded statue of Ganesha owned by the Ghosal family, and when Umanath refuses to sell the figure, Meghraj shows his anger. Their conversation is overheard from the corridor outside the room by a young man, Bikash (Biplab Chatterjee), who lives in the home. Right away we can see that Meghraj is the villain of this piece, and the viewer might well wonder how much mystery will be involved in revealing the culprit of this tale. That night someone sneaks into the Ghosal house and steals the Ganesha statue. The next day Feluda, Topshe, and Jatayu are shown arriving in Kashi to see the city and observe the traditional puja rituals. They check in to a hotel suite which they are to share with a muscular body-builder, Biswasree Gunomoy Bagchi (Moloy Roy). Biswasree’s presence in this tale turns out to be just a colorful piece of dazzle that is likely to fascinate a youthful audience. 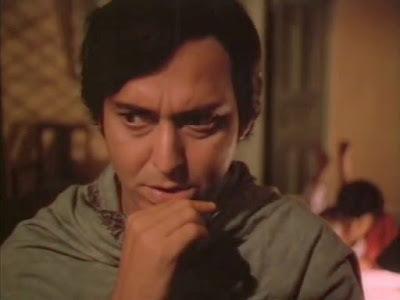 Then the Feluda trio head out to the ghats along the Ganges river, where they observe a visiting Hindu holy man, Machli Baba (Monu Mukherjee), who has attracted excitement from the local populace for his alleged saintly powers. Among those ceremoniously coming to seek Machli Baba’s blessing is Maganlal Meghraj. Then the Feluda trio are introduced to Umanath Ghosal, who tells Feluda about his stolen statue and seeks to engage the famous detective to help identify and snare the culprit. Feluda goes to visit the Ghosal estate, where he is given more information about the Ganesha theft. There he talks to Ruku, Bikash, Umanath Ghosal, and Umanath’s elderly father, Ambika Ghosal (Bimal Chatterjee as), who is the head of Ghosal estate and therefore the real owner of the stolen Ganesha statue. At this point and for various reasons, Feluda believes, correctly, that Ruku, Bikash, and Umanath are not telling him the entire truth about what happened. Feluda and his two friends are now summoned to Maganlal Meghraj’s dark mansion, where the sinister Meghraj tells them that the debt-ridden Umanath Ghosal stole the statue, himself, and then sold it to him. He offers a bribe to Feluda to drop his investigation. 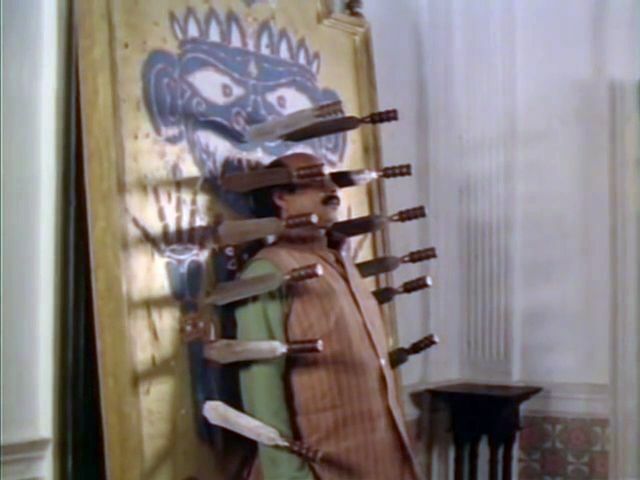 When Feluda refuses to accept the bribe, Meghraj subjects Jatayu to a life-threatening horror as a target for his shaky knife-thrower. Feluda and Topshe are powerless to defend their terrified friend, because they can see a gun pointed at them from the upstairs balcony. Jatayu does survive the ordeal, and when they are finally out on the street, the humiliated Feluda vows to take his revenge on Meghraj. Feluda also concludes that Meghraj probably lied about possessing the Ganesha statue. Continuing his investigations, Feluda now becomes suspicious of a clean-shaven young man he sees on the ghats who reminds him, perhaps because of a tattoo, of the bearded Machli Baba he had seen being worshiped earlier. He follows the young man to his lodging and furtively confirms his earlier suspicions that Machli Baba is a fake by finding the phony saint’s false beard and dressing gown. He also sees a locked chest that he suspects contains stolen goods – and perhaps even the Ganesha statue. Meanwhile the idol-maker Sashi Babu discovers the Ganesha statue lying on the ground at the foot of his Durga idol. But shortly thereafter, Feluda and his friends discover Sashi Babu murdered on the street. Now, on the basis of this evidence and some other suspicions he arrived at along the way, Feluda conjectures that the boy Ruku had earlier hidden the stolen Ganesha figure by sticking it with chewing gum inside the lion’s mouth in Sashi Babu’s Durga idol. We also learn that Ruku reported to Ambika Ghosal that he had overheard Maganlal Meghraj’s original bribe offer to Umanath Ghosal. There are further complications, because we learn that Bikash, for a bribe from Meghraj, had intended to steal the little statue from Ambika Ghosal’s trunk, but found it missing when he surreptitiously went to get it. He did wind up getting it from Shashi Babu and handing it over to Meghraj, together with the fateful information that Babu had had it. This sets the stage for Feluda’s dramatic costumed ruse to capture Meghraj red-handed in the act of secretly passing on stolen goods to the fake holy man. Afterwards Meghraj is given Feluda’s revenge treatment – he is subjected to the same kind of terrifying life-threatening target practice that Jatayu had faced, but this time involving a gun instead of knives. And in the very end, although we more or less knew all along the main point that Maganlal Meghraj was the bad guy, there is a further twist that will intrigue the viewer. Overall, Joi Baba Felunath: The Elephant God is a well-made concoction of family entertainment, but there is an element here that I find disappointing. Ray’s presentation, indeed celebration, of vengeful payback at the end of the film is unworthy of his refined sensibilities. And revenge is not a suitable message to light-heartedly present and endorse to a youthful audience. See if you can spot their lies early on when you watch Joi Baba Felunath: The Elephant God. “Feluda”, Wikipedia, (9 October 2018).